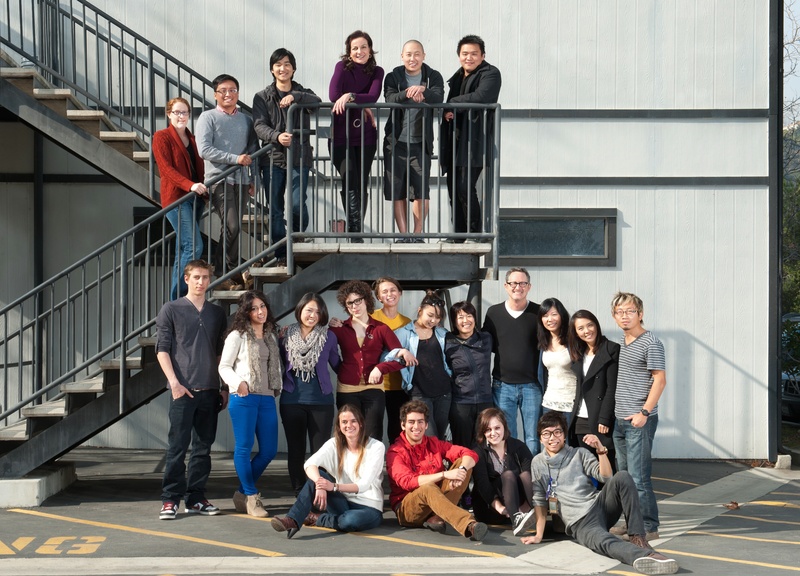 Class shot of the TEDx Art Center College of Design Studio. Photo: June Korea. Orange will mix with red this summer when the student-driven TEDx Art Center College of Design conference takes over the Hillside Campus on Saturday, June 9 to explore the event’s theme: “Design a ________ for Social Impact.” The “blank” in that title is a call-to-action designed to inspire conference attendees to come up with their own idea for how to effect positive change in the world. Also on hand to inspire attendees will be an impressive lineup of speakers, including Doug Powell, national president of AIGA and the individual spearheading that association’s Design for Good initiative; and Cameron Tonkinwise, chair of Design Thinking and Sustainability at Parsons The New School School for Design, whose current research is exploring design-enabled sharing of resources. And for something completely different, Art Center Product Design alumnus and KILLSPENCER founder Spencer Nikosey has been tapped to provide the day’s musical entertainment. 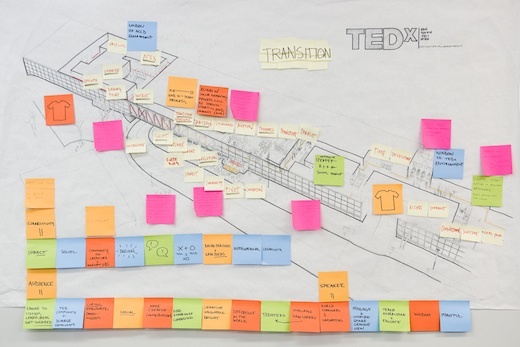 The TEDx Studio class spent the entire term designing the upcoming experience. Photo: June Korea. For the uninitiated, TED (Technology, Entertainment, Design) is a non-profit organization that brings together luminaries from a multitude of disciplines to disseminate “ideas worth spreading.” The foundation holds two annual conferences, hosts free videos of the conferences’ talks on its website, and has spurred the development of TEDx events, independently organized TED events that stimulate dialogue at a community level. TEDx studio midterm presentations. Photo: June Korea. Natural? Yes. Easy? No. The road to bringing TEDx to Art Center began in June of last year, when Prieto and her fellow TEDx co-organizer, newly-graduated Graphic Design alumnus and former Student Government President Erik Molano, realized they had each independently decided they wanted to bring TEDx to Art Center. The two spent months meeting with TEDx organizers throughout the Southern California region, rallying Art Center administration behind the concept of hosting the event and then setting goals for the conference. 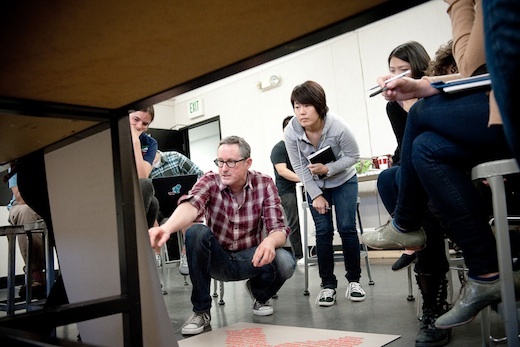 Things really took off when they organized a for-credit transdisciplinary studio course for the Spring 2012 term whose goal would be to bring the event to fruition. 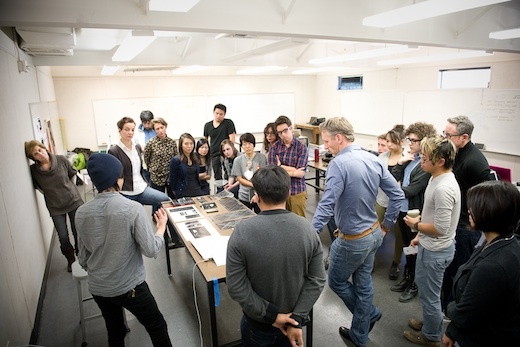 The course was sponsored by the College’s Designmatters department, hosted by the Environmental Design Department, and co-taught by instructors Robert Ball (Environmental) and Petrula Vrontikis (Graphic Design). Environmental Design student Catherine Menard presents at the TEDx midterm. Photo: June Korea. The course ended up involving 19 students from five different majors: Susyn Herridge, Ina Kanaoki, Jenn Kuca, Maria Mak, Catherine Menard and Alex Yee from Environmental Design; Geoff Ka’alani from Graduate Media Design; Ian Abinoja, Deanna Hagopian, Yeji Kim, Molano, Carly Stevens and Ken Watanabe from Graphic Design; June Cho and Robin Gilli from Photography & Imaging; and Chiyo Benigno, Devin Huang, Mike Kim and Prieto from Product Design. The answer to that first question—what does a TEDx event at Art Center look like—was recently answered at the class’ final presentation on Friday of Week 13 of the Spring term. In front of an audience in the Ahmanson Auditorium that included Art Center Provost Fred Fehlau and Dean of Special Programs Nik Hafermaas, the class presented everything from unconventional name badges and thought-provoking wayfinding signage to a dramatic re-imagining of Hillside Campus’ south entrance and a striking transformation of the auditorium itself. As for the question of why discuss social change and sustainability at a design school, Molano and Prieto point to the groundbreaking work that the College’s Designmatters department has achieved over the past decade. But they also believe the speakers and the attendees will answer that question themselves through their participation. They will, in effect, fill in the blank in the “Design a ________ for Social Impact” by engaging in the event. Instructor Robert Ball and Product Design student Chiyo Benigno. Photo: June Korea. In addition to the previously-mentioned Powell and Tonkinwise, other speakers at the conference will include: Robin Bigio, industrial designer at IDEO.org; Dr. Lorne Buchman, President, Art Center College of Design (“He won’t be talking about Art Center,” said Prieto. “He loved that idea.”); Charlie Cannon, an associate professor of Industrial Design at Rhode Island School of Design and founder of LOCAL Studios; Allan Chochinov, the chair and co-founder of the Products of Design M.F.A. program, School of Visual Arts and Editor-in-Chief, Core77; Terry Irwin, head of the School of Design, Carnegie Mellon University; Dr. Pardis Mahdavi, Associate Professor of Anthropology, Pomona College and author of Gridlock: Labor, Migration and Human Trafficking in Dubai; Dr. Jerry Schubel, President and CEO, Aquarium of the Pacific; and feminist, social activist and filmmaker Jasmina Tesanovic. 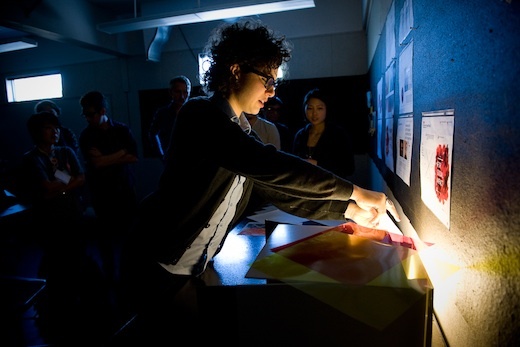 TEDx students receive feedback at the studio's final presentation. Photo: June Korea. Though the TEDx class technically ended last week, for many of the students the work is only going to get more intense as the conference approaches. With only seven weeks left before the conference date, a core group of students from the class will be spending their Spring Break not at some tropical resort but at their computers or in the studios planning the College’s TEDx transformation. But even in the midst of finals, graduation and preparations for the big day, the TEDx organizers are already thinking beyond the upcoming conference. 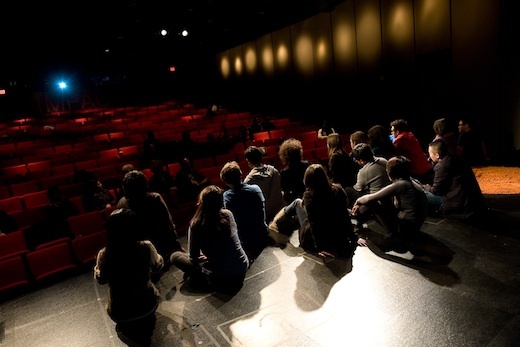 For the latest updates on TEDx Art Center College of Design, visit the conference’s website.